AUSTRALIAN Ninja Warrior fans have been left feeling a certain kind of disappointment they probably haven't felt since Georgia Love dumped Matty J in last year's finale of The Bachelorette. Perhaps even worse. Because - even though you might not have agreed with Georgia choosing Lee - at least someone won The Bachelorette. 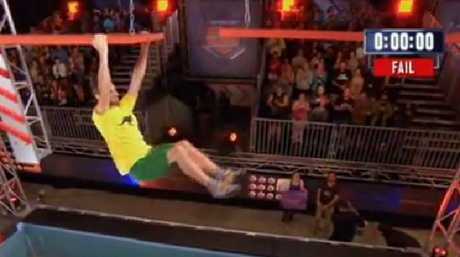 After committing three weeks to Channel Nine's extreme reality series, Australia tuned in to the Australian Ninja Warrior grand final on Tuesday night to see which everyday athlete would take home the title of champion. In the much-hyped finale, 21 remaining ninjas were tasked with battling a brutal three-stage course in the hope of being crowned Australia's Ninja Warrior. If contestants blitzed the nine obstacles in stage one, they would move onto stage two, which was made up of eight even more insane obstacles. Stage three was Mt Midoriyama: a 22m rope climb to be completed in 30 secs. But contestants soon dropped like flies. Only eight made it through to stage two. And zero arrived at the stage three. Mt Midoriyama was left unscaled. "It's no wonder our expert said he wouldn't be surprised if no one gets to the end of stage two - nevermind Mt Midoriyama." After all, in America, it's taken seven seasons of the show for a contestant to scale the final stage and be crowned champion. As the finale wrapped, fans were quick to voice their dismay on social media about the result - many blaming the time limits placed on contestants to complete the extreme courses. "Congratulations on ruining such a good show with the time limit," one viewer tweeted. Another noted: "Who was the genius who set the time at 65 seconds - pretty silly and impossible." Many contestants tripped in the first few obstacles of stage one - which included the "big dipper", a "spinning log" and new obstacle "the spider jump". Rock climber Ben Cossey, along with brother Lee, was a hot favourite to take out the competition. But he failed to make it through to stage two. He tripped on the spinning log but quickly recovered to make it through the spider jump - which required contestants to bounce up and wedge themselves between two walls. But the rock climber lost his grip on the globe grasper and was eliminated. Daniel Weston, the 19-year-old who gained fans dressed as Tarzan, also made an early exit alongside stuntman Jayden Irving, Ryan Solomon, Sam Goodall and William Laister. New South Wales rockclimber Tom O'Halloran was the first of eight to make it through to stage two, finishing the course with 59 seconds to spare. While Jack Wilson's budgie smugglers almost threatened a wardrobe malfunction, the 24-year-old remained focused and finished with 27 seconds to spare. After being disqualified for touching the water in the grand final of the UK version of the series, it seemed history was repeating itself for Fred Dorrington. The 27-year-old was stopped in the middle of stage one as judges assessed whether his foot had touched the pool. But he was safe, and went on to complete the stage with 20 seconds left on the clock. Lee Cossey, Alex Matthews, Ashlin Herbert, Ben Polson and Rob Patterson rounded out the eight contestants to make it through to round two. If stage one was brutal, stage two was impossible. The contestants had just 65 seconds to complete five obstacles; then, if they had beaten the time limit, they faced another three obstacles after that. All eight failed. Most contestants got caught up on the first obstacle - getting tangled in a sea of ropes and failing to dismount. While Fred Dorrington powered through the initial obstacles of round two, he lingered too long on the unstable bridge and was left hanging as the siren sounded and he ran out of time. "It was pretty intense. Didn't get as far as I'd have liked. But I'm stoked," he said. While Dorrington didn't make it Mt Midoriyama, he went home as the contestant to make it the furthest in the series. Still, it was a let down some fans couldn't handle.